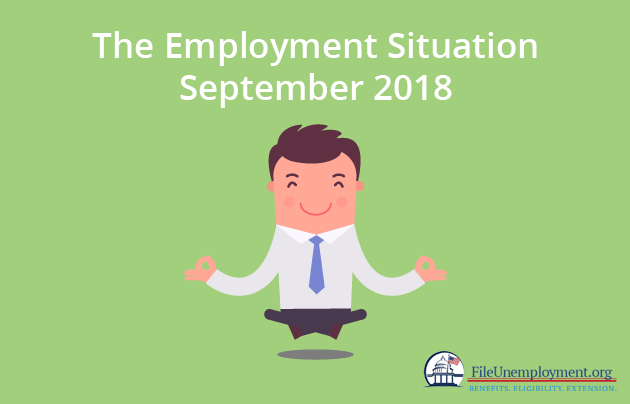 The September unemployment rate declined to 3.7% in September and the total nonfarm payroll employment increased by 134,000. The main job gains were in the professional and business services which includes health care, transportation and warehousing. Hurricane Florence affected sections of the East Coast in the month of September and this would be the reference periods for establishment and household surveys. Response rates for the two surveys were within the normal range. When it comes to the establishment survey, the reference period of the pay period is the 12th of the month. But unusual weather is more likely to have an impact on the average weekly hours than on employment. You should know that average weekly hours are estimated for paid time during the pay period which includes holidays, sick leave and time off from work. The impact could be severe weather on hours and this could result in a reduction in the average weekly hours. For instance, while some employees do not work for part of the pay period or haven’t received pay for time missed others could deal with cleanup, repair and extra work hours. While the unemployment rate declined by 0.2% leaving it at 3.7%, accordingly the number of unemployed decreased by 270,000 to 6 million. In the last year, the unemployment rate and number of unemployed persons declined by 0.5 percentage points closing it at 795,000 unemployed persons. While the unemployment for white and adult women declined in September. There was little or no change for adult men, teenagers, Blacks, Asians and Hispanics over the entire month. At the same time, the number of long term unemployed or those that are jobless for 27 weeks or more changed a little at 1.4 million over the month. These individuals accounted for 22.9 percent of all unemployed. In September, the labor force participation rate remained at 62.7%, and the employment population ratio changed a little at 60.4%. The number of persons employed part time for economic reasons increased by 263,000 to 4.6 million in September. Also, 1.6 million persons were marginally attached to the labor force which is almost the same as before from a year earlier. These individuals do not fall under the labor force but looked for work for the last 12 months. Of the marginally attached workers, there were 383,000 discouraged workers which is almost unchanged from a year ago. The remaining 1.2 million persons are marginally attached to the labor force in September and had not searched for work for reasons such as school attendance or family responsibilities. The nonfarm employment rose by 134,000 in September as compared to the average monthly gain of 201,000 over the previous 12 months. In September, job gains have occured in professional and business services, health care, and transportation and warehousing. At the same time employment has increased by 54,000 in professional and business services and rose by 560,000 over the year. Similarly, health care employment grew by 26,000. Hospitals added 12,000 jobs while ambulance health care services increased by 10,000. Overall, health care employment has increased by 302,000. Transportation and warehousing employment rose by 24,000. Job gains in warehousing and storage increased by 8,000, couriers and messengers by 5,000 and the over all transportation and warehousing would be increased by 174,000. Construction employment continued to trend up by 23,000. The industry in total added 315,000 jobs over the past 12 months. Employment in manufacturing continued to grow as 18,000 people joined the workforce. Over the past 12 months, manufacturing added 278,000 jobs which is four-fifths of the gain of the durable goods. Mining rose by 6,000 over the month and 53,000 over the year. The hospitality and leisure industry lost 17,000 jobs in the month of September. There is little or no change in wholesale trade, retail trade, information, financial activities and government. The total nonfarm payroll employment for July was revised from +147,000 to +165,000 and the change for August was revised up from +201,000 to +270,000. Based on these revisions, employment gains in July and August combined were 87,000. Also, after the revisions job gains has averaged 190,000 per month for the last 3 months in 2018.